On Tuesday, February 14th, 2017, the world premieres of two short Croatian films were held in the Berlin International Film Festival’s Generation programme. Generation Kplus screened the animated film Hedgehog’s Home by Eva Cvijanović, while Generation 14plus screened Antoneta Alamat Kusijanović’s film Into the Blue. After generations of children who have grown up with the story Hedgehog’s Home, the literary classic by Branko Ćopić has a new opportunity to win over newer generations. The fable about the importance of home, told through the story of a hedgehog meeting a number of forest dwellers, packed the Haus der Kulturen der Welt Cinema. 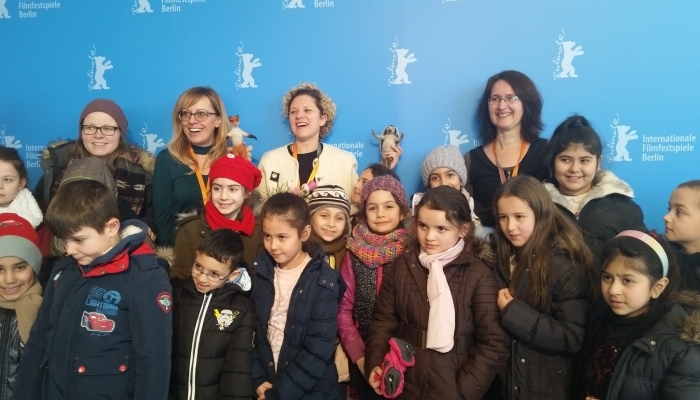 After the screening, young viewers applauded the film, and hurried to take photos with the film’s director Eva Cvijanović and starring puppets Hedgehog and Fox. The film screened in the Generation Kplus programme of the Berlin International Film Festival. ‘We are all simply elated with the premiere! The theatre was full of children and it was a real pleasure watching the film in such company. Children are a very honest and easy-going public, and based on their reactions, they were charmed by the Hedgehog. The Q&A was sweet; I was even asked a very concrete question about the film’s ending. I was so happy with the reaction, because it shows that even those who never grew up with the fable can connect with the story. 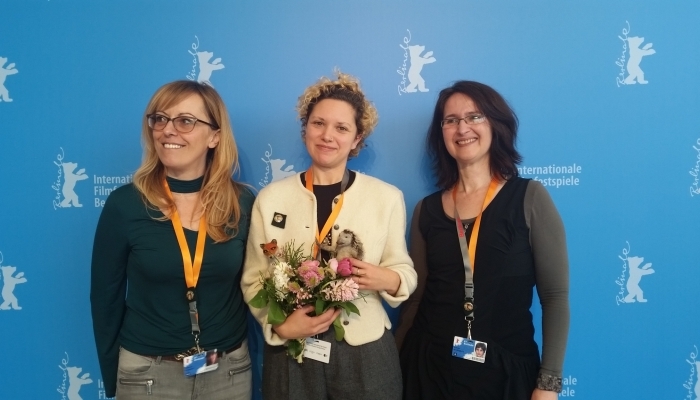 All in all, it was awesome!’ said Eva Cvijanović, who was joined at the premiere by producers Jelena Popović (NFB) and Vanja Andrijević (Bonobostudio). The film is a co-production between the National Film Board of Canada and Croatia’s Bonobostudio, and was co-financed by the Croatian Audiovisual Centre and the City of Zagreb Office for Education, Culture and Sport. Antoneta Alamat Kusijanović’s short film Into the Blue also generated a lot of interest. Her film was screened in the Generation 14plus programme, and in attendance, along with Kusijanović, were members of the cast: Gracija Filipović, Vanesa Vidaković Natrlin, Dominik Duždević and Andro Režić. Into the Blue is a film about Julija, a thirteen year-old girl who, after being away for a few years, tries to reconnect with her best friend. But her friend is in love and Julija is not so important to her anymore. The producers are Barbara Vekarić and Vlaho Krile (Motion), as well as Zoran Dževerdanović (Blade Production). The film also received financial support from the Croatian Audiovisual Centre. Generation is a competition at the Berlinale, screening films geared thematically and aesthetically toward children and youth. The programme is made up of two parts: Generation Kplus and Generation 14plus, and the best films win a Crystal Bear and a cash prize. The programme attracts more than 65 000 visitors each year. The 67th Berlin International Film Festival is taking place from February 9th to 19th, 2017. For more information please visit the festival’s official website.